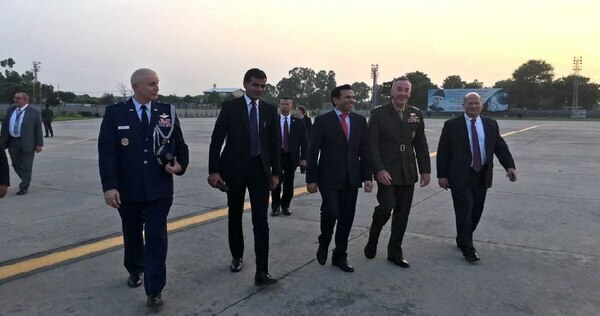 ISLAMABAD — Secretary of State Mike Pompeo and Chairman of the Joint Chiefs Marine Corps Gen. Joseph Dunford said rounds of talks with Pakistan’s leaders Wednesday provided an opportunity to “reset the relationship” between the two countries but acknowledged both sides had a long way to go on key security issues. “We’ve had lots of times where we’ve talked and made agreements, but we haven’t been able to actually execute those,” Pompeo said. Today’s discussion, with newly-elected Prime Minister Imran Khan, his foreign minister Shah Mahmood Quareshi and Pakistani Army Chief of Staff Javed Bajwa, had a different tone, Pompeo said. “There was broad agreement … that we need to begin to do things that will begin to actually on the ground deliver outcomes so we can begin to build confidence and trust between the two countries,” Pompeo said. U.S. military and diplomatic leaders seek to persuade Pakistan to go after Haqqani, Taliban groups within its borders. However there were no specific agreements reached Wednesday that could lead to the U.S. reinstating some of the military aid it has withheld, Pompeo said. “We’ve still got a long way to go,” Pompeo said. The Pentagon says it’s taken final steps to cancel $300 million in planned aid to Pakistan. Dunford also said there were no indications that the U.S. use of supply routes through Pakistan would be impacted even as the latest U.S. round of withheld military aid takes effect in Pakistan. “We don’t have any reason to indicate that our cooperation in keeping the GLOCS open is going to change,” Dunford said, referring to key shipping routes. Dunford is on a week-long trip to meet with his counterparts in Pakistan and India to discuss the South Asia Strategy and ways both countries can do more to help stabilize Afghanistan.